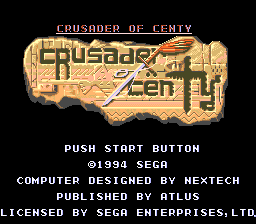 Crusader of Centy in the US, Soleil in Europe, Shin Souseiki Ragnacenty (新創世紀ラグナセンティ) in Japan, and Ragnacenty in Korea, is an adventure game developed by Nextech under contract from Sega in 1994 for the Sega Mega Drive. The game was translated to Korean, English, French, German, and Spanish. The North American release was localized and published by Atlus. The game's music was composed by Motokazu Shinoda, a professional Japanese concert pianist and composer (sound programmer Noriyuki Iwadare is often miscredited as co-composer). Soleil is a village in a large continent overrun by monsters, and the crusaders of Soleil are sent out by the King to save the humans. While on your own quest, you save an old lady who tells you to talk to a fortuneteller west of Soleil, who exchanges your ability to talk to humans with the ability to talk to animals (for the first half of the game, that is). Now, you must rely on your sword and the aid of a group of animals to rid the world of monsters — though along the way, you'll come to realize monsters aren't as evil as the humans make them out to be. swings your sword. Early in the game you pay a soldier to grant you the ability to hold to shoot your sword straight ahead. jumps (this ability must be learned early in the game). Along the way, you have certain animals join your pack, each with their own abilities that aid you in some way. You can have up to two active at any time, and carrying two often allows you to combine their abilities into even more useful abilities. Some animals have further abilities activated with the button. When paused, you may select animals or save (you may save at any time but will start at the beginning of the room/field); once all your health is gone, you will die and be returned to the title screen. Orange and red Apples give you back health; golden Apples of Life restore all health. Mac: Johnny Your pet dog. With , he will stay where he is and hold any enemy that happens to run into him still. Flash Charlie A cheetah who you have to beat in a race to acquire. He will make you run 2x faster and jump farther. Cecil Ciel A flying squirrel who will allow your sword to be thrown farther and ricochet from walls. All sword techniques abort immediately with . Dippy Dinosaur A lazy dinosaur who you talk into leaving his home in a desert oasis and joining you. You ride him to cross bodies of water on the world map and some water/goo pits in the areas. He will move faster if combined with Flash. Monarchy Butterfly A butterfly who allows you to guide your sword while it is being thrown. With Cecil the sword will travel in circles. Dodo Dodo A dodo bird who will attach your thrown sword to an enemy (usually resulting in the enemy coming to you in return). Rio Armadillo An armadillo who with will turn into a platform you can pick up and throw with (useful for crossing water or hitting buttons). Inferno Lion A lion who sets your sword on fire for extra damage. With Dodo, the attached sword causes extra damage. Leviathan Leviathan A monster you must defeat in a boss battle for him to join you. He speeds up your sword swinging and throwing 2x. Chilly Penguy A penguin who, similar to Inferno, will freeze your sword for extra damage, and has the same effect with Dodo. Combined with Inferno, the freeze will be slightly more powerful. Wong RaccoonDog A raccoon who will cloak himself to look like you with , distracting enemies. Moa Moa A bird who strengthens its partner's abilities. For example, Monarchy and Cecil's powers can be applied for as much time as you like (hit to stop), Flash and Leviathan will have their effect increased from double to triple, and further increases the damage Inferno and Chilly do. Kitty Kitty A cat you rent in an "Animal Village" for 50 gold coins. He will give you a second chance if you die (but only once). Batty Bat A bat you rent for 100 gold coins. He will give you 20 seconds of invincibility once. Edgar Egg An animal you rent for 50 gold coins. He will damage everything on screen for 5 seconds once. Main article: Crusader of Centy/Magazine articles.